'개발' 태그의 글 목록 :: 오늘을 살자..
Hercules 유용한 시리얼 터미널 프로그램이다. 물론 프리웨어 Freeware 이다. 링크 정보는 아래와 같다. https://www.hw-group.com/software/hercules-setup-utility 실행 그림은 아래와 같고, 사용법은 아주 직관적이라 쉽게 사용가능하다. 또한 시리얼 터미널 이외에 간단한 TCP/IP 소켓 테스트도 가능한 툴로 아주 유용하다. Hercules SETUP utility is useful serial port terminal (RS-485 or RS-232 terminal), UDP/IP terminal and TCP/IP Client Server terminal. It was created for HW group internal use only, but t..
웹사이트 개발을 위한 에디터라고 하네 #html #css #editor 방문해서 설치해 보더라고. 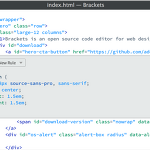 Brackets - A modern, open source code editor that understands web design A modern, open source code editor that understands web design Brackets is a lightweight, yet powerful, modern text editor. We blend visual tools into the editor so you get the right amount of help when you want it. With new features and extensions released every 3-4 wee..